In a tacit acknowledgment that its efforts to recruit major non-retail employers to the city in a healthy economy has gone unfulfilled, the City of Elk Grove has turned its economic development efforts to an area with intimate familiarity - the pursuit of more retailers. 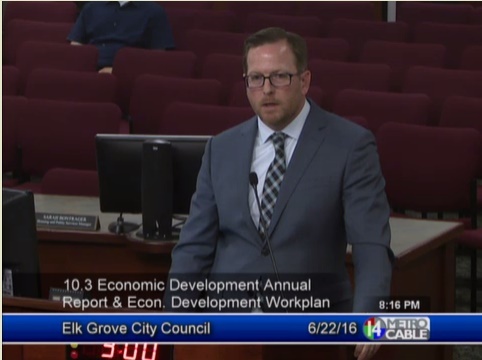 That was the message in a presentation by Darrell Doan, the city's economic development director at the Wednesday, January 26 meeting of the Elk Grove City Council. Doan's presentation on his departments efforts specifically focused on recruiting more so-called lifestyle retailers to the city of 172,000. Hired as the city's economic development director in April 2015, Doan took the reigns from former director Randy Starbuck. While the economic development director position was created six years ago, neither Strarbuck nor Doan have landed any significant employers. During his presentation, Doan noted that sales taxes revenue is the biggest single source of revenue for the city and a significant employer. These revenue account for 38-percent of the general fund receipts. "Retail is critically important to the city of Elk Grove on a number of fronts," Doan said. "First, retail employment accounts for 26-percent of the city's employment base. It is virtually tied for the top employment sector in the city." Doan noted that Elk Grove lags other Sacramento County communities not only in retail sales generated but also in commercial space available for tenants. He also said there are low vacancy rates, and those properties in the city which are not in use, some of which have never been occupied, are sub-standard. "I need properties to attract retailers too," he said. In a discussion of the unfinished Outlet Collection at Elk Grove, which he said will be a hybrid between a typical outlet mall and a lifestyle center, Doan expressed both confidence and frustration with the property's owner, Howard Hughes Corporation. That shopping center, known as the Ghost Mall, has sat unfinished on the city's south side for over nine years and has been a continuing source of embarrassment for Elk Grove city leaders. "We need to continue our efforts to induce the Howard Hughes Corporation to get off the dime and build the Elk Grove collection," he said. "I think we are all tired of waiting for that, and I think we all feel there have been a lot of broken promises to this community." Doan said he was optimistic saying "you pay me to be optimistic" but he added there is no guarantee that construction will resume. "Right now I am optimistic, and here is why," he said. "With the casino approvals, and that project is coming to market sooner than any of us might have thought...it has already made a significant impact on the leasing activity at the Elk Grove Collection." Earlier this week an administrative process advanced the approval of the proposed $500 million casino resort being built by Las Vegas-based Boyd Gaming for the Wilton Rancheria. Notwithstanding the regulatory step, the casino is facing litigation in Federal Court which could indefinitely delay final approval for the project. Doan said that if the city wants to recruit high-end retailers, there is no suitable space currently available in the city. To solve this, he suggested developing the city-owned 20-acre parcel in the civic center area of Laguna Ridge as a lifestyle center. "This is prime land for retail," he said. Noting the parcel is directly adjacent to 25-acres owned by Pappas Development, Doan said that by combining the two lots into a 40-acre high-end shopping center could be developed "right in the heart of the city." Doan went on to say the all the families or out of town visitors to the aquatics center or attending events at the civic center facilities will be attracted to the shopping center. "We give it to them right there, they walk across the street, to a fantastic retail environment," he said. "It is seamless with our civic center. This is a major opportunity." Additionally, Doan defended the hiring of Birmingham, Alabama-based Retail Strategies. That firm, which represents the city at retail trade shows, helps in retail recruitment efforts and has produced some market information for the city, was awarded a $50,000 contract last April. "Their contract is up in April, we'll have to make a decision about whether to renew with them or bring in someone else," he said. "But we need representation. I can't be everywhere all the time." Miwok, so are you saying the residents of Elk Grove will have to wait another five to 10 years for the outlet mall? I have my doubts it will ever become a reality. One look at Delta Shores, its close proximity to Elk Grove, and how massive it is, gives me pause that the outlet mall is never going to happen. I wouldn't be surprised if the Howard Hughes Corporation has put the rest of the land up for sale, secretly, of course, as was the casino land. Elk Grove residents only heard of the sale after it was a done deal. So stay tuned. . .
Ms./Mr. Miwok, if it was such a sure thing for the Wilton Rancheria and Boyd Gaming, not to mention HHC, why hasn't Chairman Hitchcock ordered the demolition of the structure on the land purchased for the casino? The answer is demolition has not started because there is a high degree of uncertainty that the tribe will be able to get through the legal hurdles. If it was such a sure thing, why not, to paraphrase President Reagan, "tear down that mall Mr. Hitchcock."